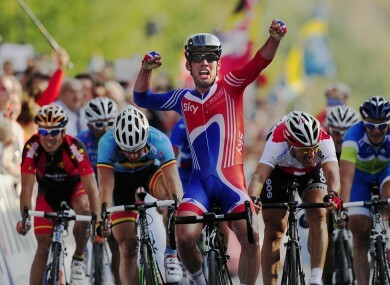 Cavendish crosses the line to take last month's World Championships road race. TOUR DE FRANCE green jersey winner Mark Cavendish has put an end to one of cycling’s longest-running transfer sagas by declaring himself willing to sign for Team Sky, the Guardian’s James Callow reports. It had long been suspected that Cavendish would join fellow Briton Bradley Wiggins at the wealthy British outfit, but the sprinter studiously avoided commiting publicly to a move. Rumours regarding Cavendish’s association with Team Sky predate the decision of his current team, HTC-Highroad, to cease operation at the end of the current season, but the announcement, made earlier in the summer, sparked a semi-public bidding war between a handful of top teams, among them Liquigas, Rabobank and Australia’s Green Edge. Over the past four seasons, the 26-year-old has distinguished himself as road racing’s premier sprinter, claiming 30 Grand Tour stages. It remains to be seen how many of HTC’s notoriously strong lead-out train also make the leap to Team Sky. Email “Finally: Cavendish declares his intention to sign for Team Sky”. Feedback on “Finally: Cavendish declares his intention to sign for Team Sky”.